Ahh… summer vacation. You plan all year and then when it finally comes, you put your trust in the universe that your week of focused fun will deliver. 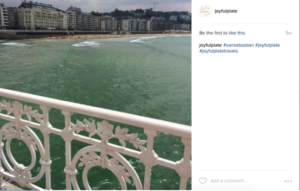 A s we enter the first week of Fall, I thought I’d take a moment to share some snapshots from a summer trip to Spain (filled with many joyful plates!). For years, I’ve had Spain on the brain. It was an unwritten chapter in my book of Euro travel. 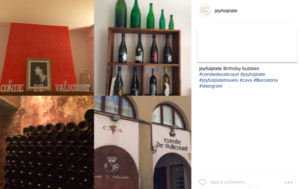 The wine business took me many times to Italy and France, and after studying Spanish wines (Rioja, Rueda, Ribera del Duero, Priorat, B ierzo, Fino, Pedro Ximinez, OH MY!) I knew I had to experience them in their place of origin. S o when the opportunity came to tour multiple cities in one trip, I jumped at the chance to take a break from branding to fuel my inner Bourdain. There was flamenco, flan, and croquettes galore. I loved experiencing it all. And the Iberico…incredible. Apparently some Italians whisper that p ure bred Iberian acorn- fed ham can be even better than prosciutto. It’s that good. My first stop to get over the jet lag-a traditional market with imaginative modern food. There was hustle, bustle and beauty at every corner. 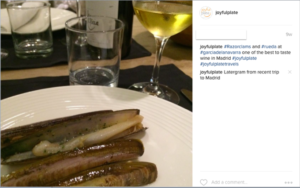 The perfect combination at Vinoteca Hermanos Garcia de la Navarra , one of the best wine lists in the Madrid. I’m still dreaming about the peas (really, the peas) that came fresh from the market in San Sebastian, simply prepared with chicken stock and white wine, brilliant with a glass of Rueda. 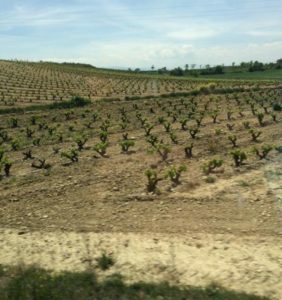 The road trip from Madrid to Rioja was easier than I expected, especially with lovely vineyard views along the way. Notice the small bushes vs. classic trellises. The bush system is suited to dryer climates. The vines provide a canopy to shade the grapes from sunlight and need less moisture than trellises. Apparently, most of the grapes are still picked by hand here. We only made one stop in Rioja en route to San Sebastian (sigh) but it was a lovely long lunch. 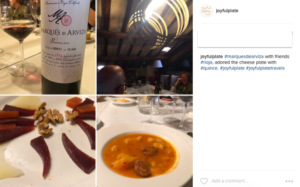 Marques de Arviza is a family-run Rioja winery with underground cellars dating from the 16th century. http://www.marquesdearviza.es/en/. 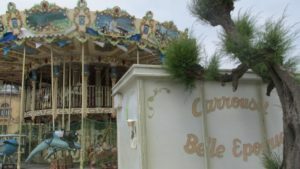 This Belle Epoque carousel on the Playa de la Concha waterfront sums up my feeling of San Sebastian: exotic, whimsical fun~with a French feel. It’s the kind of magical place where you meet new friends over a plate of shishito peppers in tiniest of bars (yes, that happened). 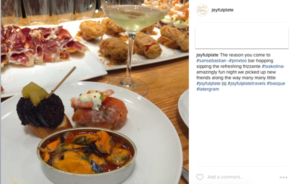 In Northern Spain, they call tapas “pintxos”- a small Basque delicacy with a little “spike” toothpick. 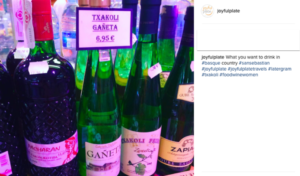 Of course San Sebastian is known for the huge number of Michelin star gastronomic restaurants, but the fun and the action can be found getting lost in the streets late night admiring and sampling an endless sea of food art and sipping txakoli: a refreshing, low alcohol wine. And the friendliest part: you eat what you like, and pay at the end. What a country! Basque country, that is. and xarel·lo are the most popular and traditional grape varieties, and only wines produced in the champenoise traditional method may be labelled “cava” (the rest, sparkling wine). 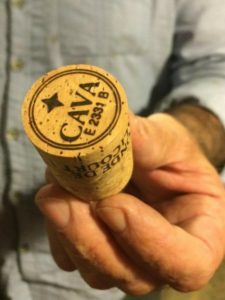 We took a day trip to Cava from Barcelona to visit a charming, small production winery that opts for quality over quantity. 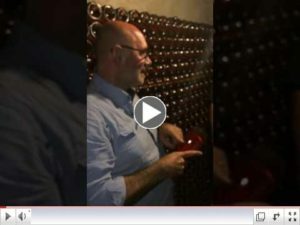 Click here for an interview with the winemaker, who explains the natural way they make rose wine-the red skin grapes make brief contact with the clear juice. he started to imagine a heaven on earth. 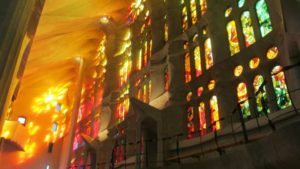 You see the metaphors everywhere in the architecture, from cypress trees, to butterflies, marigolds, honeycombs, sea coral and much more. 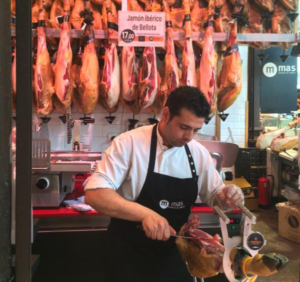 I toured La Boqueria with local Chef Jaume, who shared all the delicious little tidbits you want to consume… like how the pigs who are raised for Iberian Jamon eat oats through the year until the fall when they eat only acorns – so by year end they have the highest concentration of flavor. 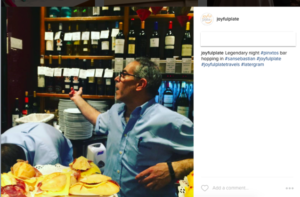 The paleta (the “shoulder”) is hung for three years until perfectly aged. 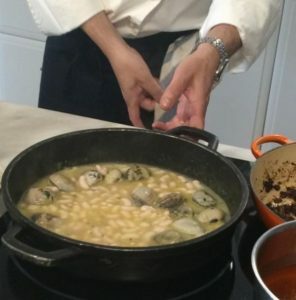 We had a wonderful day of cooking with Jaume, a great ambassador of Spanish cuisine. Together, we made specialties like paella, esqueixada de bacalao (salt cod), pan con tomate (bread with tomato), fideaua (thin short noodles with -cuttlefish) and crema catalana. 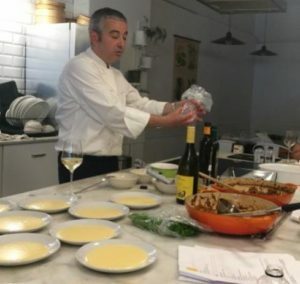 Jaume is available for local market tours and cooking classes. 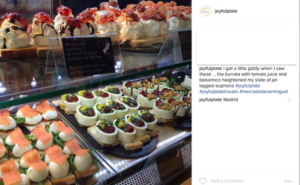 Please contact michelle@joyfulplate to request Jaume for corporate events and restaurant/hotel concept development (www.jaumebrichs.com). 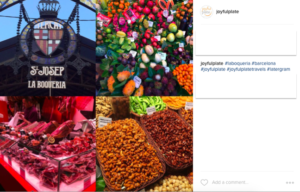 Although summer has come to an end, there’s fall cooking to look forward to: Spanish style! And more great branding work to be done.